Gluten Free Irish Colcannon is pure comfort food! 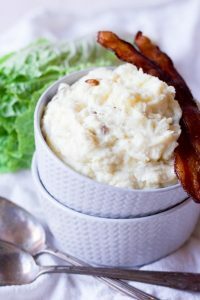 This Irish dish is full of creamy mashed potatoes, cabbage and crispy bacon instead of the traditional ham. This is a wonderful dish for St. Patrick’s Day, but perfect for any other occasion too. Wash and peel the potatoes. If using Yukon Gold potatoes, cut into quarters, otherwise cut potatoes into about 1-inch chunks. Add potato chunks into a large stockpot. Cover with just enough water to cover the potatoes (literally just enough, do not pour too much water into the pot). Bring to a boil uncovered. Once boiling, reduce to a low boil for about 15-20 minutes, until potatoes are fork tender (will fall apart easily when poked with a fork). In a medium-size saucepan, heat the milk over low heat. While the potatoes are cooking, wash and prep the cabbage. I used Napa cabbage, removing the tougher white bottom, then julienne the green leaves. If using regular green cabbage, quarter, remove the core, and finely shred/chop the cabbage. [Note: I prefer shredded/julienned pieces in the Colcannon, but if you prefer smaller pieces, make sure to chop/dice the shredded cabbage.] Set aside. Once the potatoes are cooked, pour the potatoes into a colander over the sink. Add the strained potatoes to a large bowl or a 9x13 casserole dish (I use a casserole dish, I find it’s much easier to mash potatoes large quantities of potatoes). Add 8 tablespoons of butter to the potatoes. Slowly add the warmed milk and sour cream. Using a potato masher, mash all of the potatoes, stirring to combine ingredients, until there are no lumps anymore, or until desired consistency. Add the shredded cabbage into the same stockpot, cover with just enough water to cover the cabbage. Bring the water to a boil, then boil for about 1 minute or until the cabbage turns a bright green color. When the cabbage is bright green, remove from the heat, add 1 tablespoon of butter, stir and cover for 1-2 minutes. Strain through a colander and add the cabbage to the mashed potatoes. Stir to combine. Add ¾ of the crumbled bacon to the Colcannon and stir to combine. Serve hot, topped with extra grass-fed butter and crumbled bacon pieces. Instant Pot Cooking Instructions: Follow step 1 except leave the potatoes a bit larger, either halved or quartered. Skip step 2 - instead add 1 cup of water to your Instant Pot. Add a steamer insert to the pot. Top the steamer with your potatoes. Secure the Instant Pot lid. Press "STEAM" and cook for 9 minutes. When the cook time is up, quick release the pressure, using caution open the steam valve with an oven mitt. Follow steps 3, 4 and 5. For step 6, keep the water that is already in the Instant Pot and press "SAUTE" and bring to a boil, then follow the rest of step 6, 7 and 8. Storage: Store the leftovers in an airtight container in the refrigerator. It’s wonderful heated up the next day. Vegetarian Option: Omit the bacon.